Let’s begin with the simplest section, the visual chart. 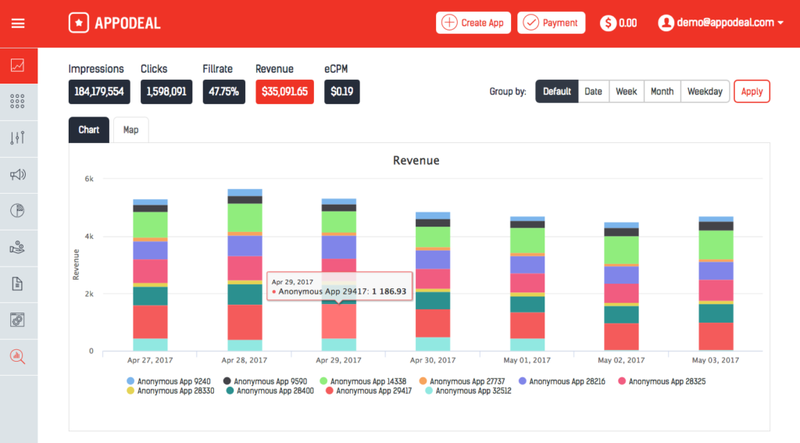 This section provides you with a quick snapshot of your apps’ revenue performances. Here you can see how much each of your apps earned over the selected time period. You can set the chart breakdown by day, week, month and even day of the week. Click on “Map” and you can see how your app is performing in different countries around the world. Our ad mediation monetizes all over the world, so it’s fascinating to see revenue coming from the most unexpected places! 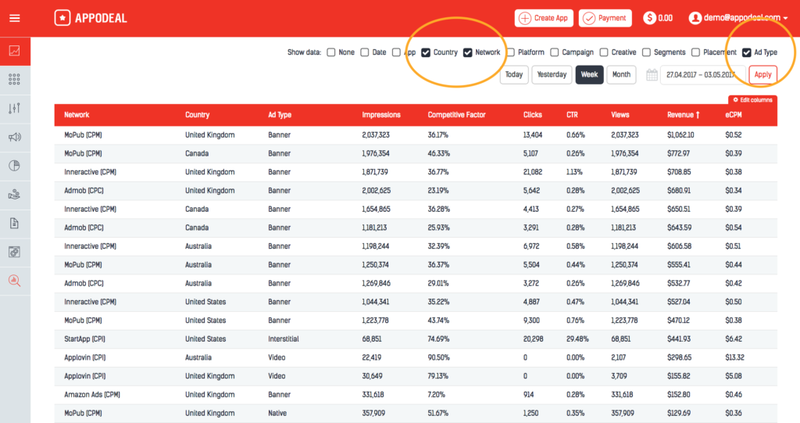 Down at the Data Table section is where you can get a more in-depth analysis of ad performance in your apps. By default, you will see an aggregate of the performance of all your apps worldwide over the last seven days. You can change the data range to any range you want. Fields include impressions, fillrates, clicks, CTR, views, revenue and eCPM. You can drill down further by selecting various data sets to show. App shows you how each of your apps performed for that time period. Country breaks down how your apps performed in each country worldwide. Network shows how each of the ad networks in our ad mediation stack performed. You can also sort each column. Here, the ad networks are sorted by their revenue. Campaign shows the results of your self-served ad campaigns, either from a direct deal advertiser or cross-promo of your own apps. Creative breaks down how the different creative ads you’ve uploaded for your self-served ad campaigns performed. Segment shows you the results based on the different user segments you’ve set up using our powerful segmentation tool. (Learn how you can set up segments here). Placement lets you know how the different ad placements you’ve set up in Segments (ex. banners on bottom of screen) performed. Ad Type breaks down how each of the ad formats (Interstitial, video, banner, native, MREC, and rewarded video) performed for your apps. By the way, any of these reports can be exported as a CSV file, which means you can easily merge the raw data with any of the other analytical tools you use. Also, if you ever need support assistance or have any questions, you can click on the red circle at the bottom, and our 24/7 support team will be here to assist you. 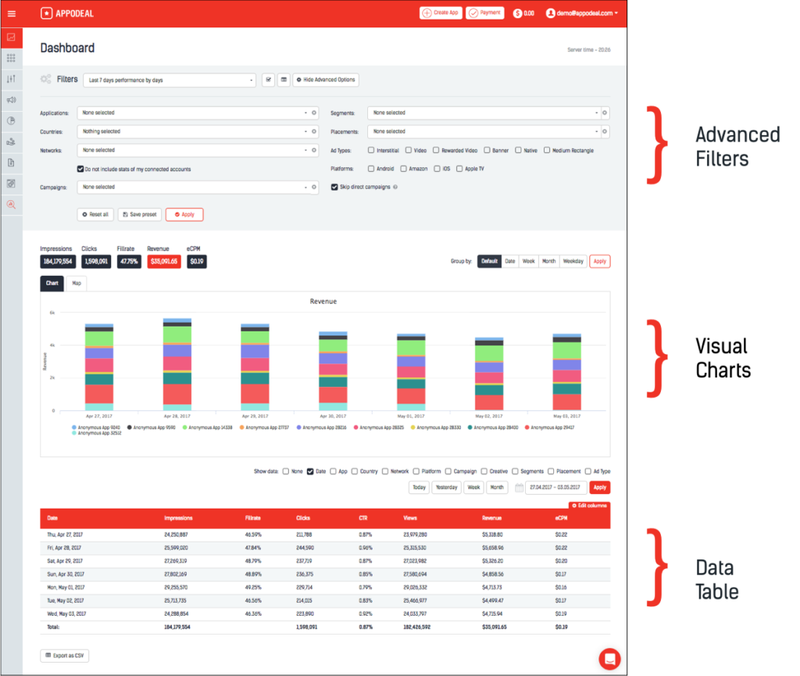 Now that you know the data analytics overview of the dashboard, you can get even more granular data using advanced filters. Let’s say one of your apps is aimed for users in the United States, Canada, United Kingdom and Australia. You can use filters to select and see the results for just users of that app from these countries. 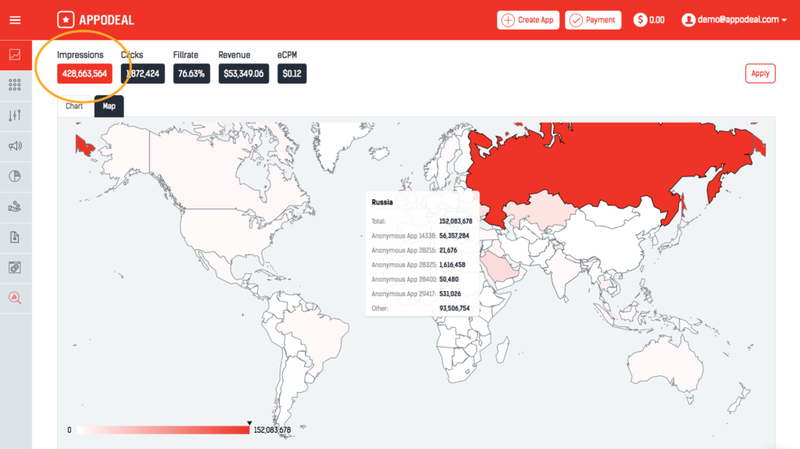 Then if you go back down to the “Data Table”, you can check “Country,” “Network,” and “Ad Type” to compare how the different ad networks and ad types perform for each of the four countries. If you had run this report without using advanced filter for these four countries first, each of the data breakdowns would have run for each of the 247 countries. This could slow down the performance of the data table. Using the advanced filters can help you get the most relevant data for you more efficiently. If there is a set of data you check up on often, the “save preset” function can save you time.Let’s imagine you only serve rewarded video ads to your app’s paid users in the United States. You would just need to assign that filter once, hit “save preset” and name the preset to effortlessly view the earnings for this user segment the next time you log on. And that’s your tour of the main Appodeal dashboard! It’s straightforward yet provides powerful in-depth analytics at the same time. Why not explore our dashboard for yourself? Sign up for the demo access here.